And that was only the one hour trip from Balmaceda Airport to the lodge in Coyhaique! We understand why you are here: To fish. To catch a huge rising Brown Trout, Brook Trout or Rainbow Trout on a dry fly – a simple act in a simple place. You are here to create a memory and to have time all by yourself or with good friends. You’ll hardly notice the fly fishing guide at all, he knows how this all works. He is in paradise as well with no need to “harsh your mellow”. His job is easy now, the lifting is done and the driving was just a beautiful prelude to an exciting day of fly fishing. You will hardly notice that your soul is catching up with you in this place, but it will, as you wade in the turquoise flow of a remote stream. Region XI is called Aysen. Though there is a multitude of Andean mountain lakes, there are also countless rivers and streams, some of which see few or no anglers each year. These fish are no fools, but they are willing! You provide a semblance of talent and the trout will reward you with a heartfelt rise and spirited fight. Local rivers include: Simpson, Paloma, Huemules, Nireguao, Blanco, Emperador Guillermo among others. You may have the idea that lake fishing involves sinking lines and chironomid patterns – not! 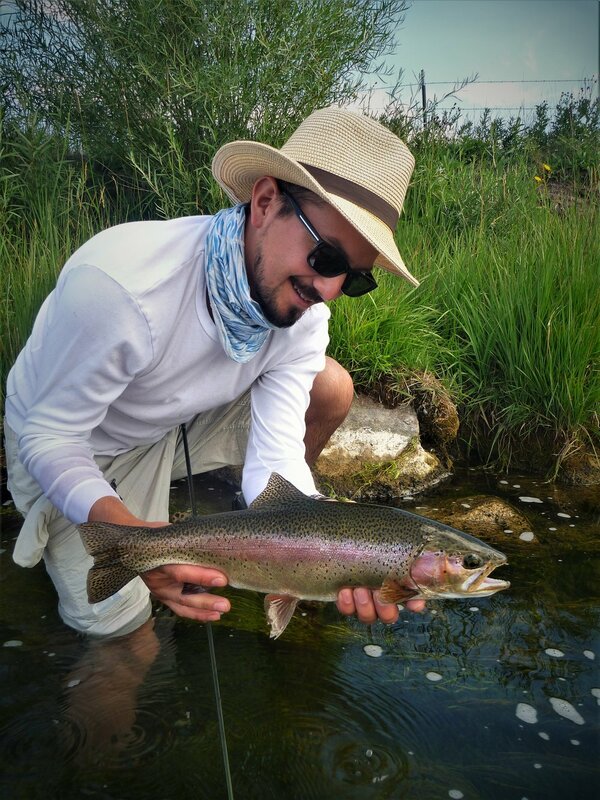 Though some anglers enjoy loch style fly fishing and have great success with it most anglers appreciate wading the shallow flats and shorelines or float-tubing the weed lines sight fishing for cruising Browns and Rainbow Trout rising to hoppers, mayflies or Chalas. Large Foam ants are the fare of choice for these hungry fish but a woolly bugger will take its share of fish as well. Between fly fishing forays you will appreciate the birds of Chile such as the Cara Cara, Pheasants, Flamingos, Southern Lapwing, Black Faced Ibis, Long tailed Mockingbird, Ashy Headed goose, the Chilean Parakeet, Great Grebe and Black Necked Swan. You may be fortunate enough to view the endangered South Andean Deer (Huemul), Fox or European Hare. Puma exist but seen by only the lucky few.